MOUNT PLEASANT, S.C.  Five miles from Charleston’s historic downtown, off a long row of gas stations and drive-through hamburger restaurants, around the corner from the Bi-Lo supermarket, the Old South is being built again. At I’On, a luxury subdivision that is scheduled to be finished in two years, ceiling fans revolve slowly on ornate two-tiered sleeping porches. Front doors are dwarfed by towering colonnades. Garages have been replaced by tiny Doric temples that fit neatly over sport utility vehicles. When Jeff Davis toured the neighborhood one recent afternoon, expressions of suffering and delight flickered over his face in rapid succession. He suffers to see the principles of classical architecture betrayed by overeager suburban builders: With uneven plinths, botched astragals, sawed-off little capitals. The delight is less complex: These are good days to be in the column business. White columns have always had a hold on the Southern psyche. Plantation owners stood them up in rows, like miniature Parthenons, at remote farmhouses. When Scarlett O’Hara’s beaux lolled against Technicolor columns in “Gone With the Wind,” their image was secured as the last word in grace and beauty. And today, during an unprecedented burst of building in the South, columns are, once again, going up everywhere. Both builders and home-buyers have been swept by nostalgia for a long-ago small-town life, and the architectural detail that goes with it. John Wieland, who owns one of the region’s largest home-building companies, says his purchases have “really gone crazy,” increasing by 20% last year. Builders know this secret about columns: They sell houses. Seventeen years ago, when Davis decided to start his company, Chadsworth’s 1.800.COLUMNS, he found himself drawn into the world of Renaissance architects like Giacomo da Vignola, who sought an ideal mathematics underlying all beauty. Davis studied the optical illusions the Greeks developed — the slight tapering and barely perceptible bulge that fool the human eye into seeing the column as straight. It was a wood business then, full of artisans and trade secrets. Columns were built like barrels, out of long wooden staves with interior joints that locked together, then turned on huge lathes that dropped long curled shavings off the side. These days, most columns begin as a gloppy liquid, something like cream of wheat. 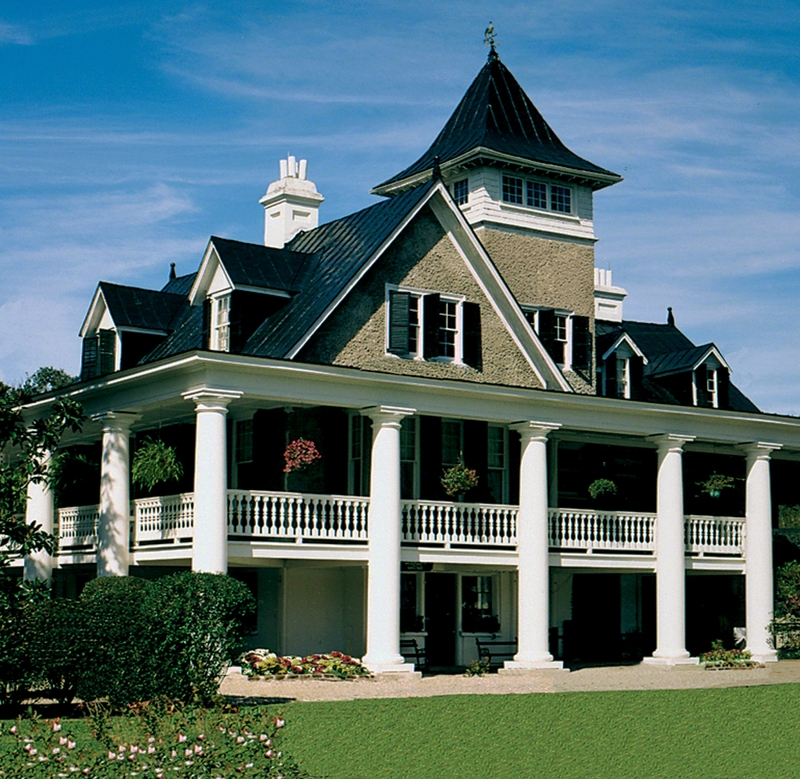 A great change swept over the industry about 15 years ago, when manufacturers found a way to build fiberglass columns that would not rot or soften. One of the composites used at the MillCast factory, in Alabama, was engineered for rocket missile casings. In an industrial park outside Pell City, MillCast workers pour a mix of resin, marble dust and shredded fiberglass into a long, thin mold that latches shut. The mold begins spinning slowly, at an angle, forcing liquid up and back into a smooth cylinder. After about 10 minutes, the mold can be opened to reveal a shaft with a sweet, chemical smell, as hot to the touch as freshly baked bread. When it is cool, and sanded to a uniform smoothness, the column is wrapped in foam and laid in a long, thin box. Workers are shipping out 500 columns a day, and even that is not keeping up with demand, said Britt Russell, sales manager for MillCast. Construction of new homes in the South has broken records this year — during one month this spring, the number of new homes built in the South almost matched the combined total in the Northeast, Midwest and West. Much of the new construction has followed the national trend of New Urbanism, in which builders recreate an old-fashioned streetscape, complete with double-stacked porches and town squares, on tracts of suburban land. The most direct way to signal this new traditionalism, builders say, is columns, which can cost as little as $100 for a slim, simple design to more than $10,000 apiece for ornate or enormous models. Outside Atlanta — whose original antebellum architecture was famously obliterated by William Tecumseh Sherman — brand-new antebellum construction is a thriving industry. When Cathy Kahn turned off the highway into Ellard Village in Alpharetta, she was charmed by the graceful double staircases and the elegant columns at the doors. She imagined sitting outside on summer evenings and chatting with her neighbors. This principle has been taken to its logical extreme at I’On, where historic-looking homes feature the deep porches and tall windows of colonial Charleston and Savannah. About a third of its 762 planned homes, which sell for $400,000 to $2 million, are built; scores more stand half-finished on newly cleared land, naked skeletons of plywood and Tyvek wrap. Peggy Orange’s fluted Ionic columns, with pillowy scrolls and egg-and-dart moldings, are so grand that her friends jokingly ask her when she’s going to install the ATM. Gary O’Neil’s carport is a miniature temple of handsome Doric columns and a shallow pediment. Joe Meli, who owns several nightclubs in the area, chose cream-colored columns 2 feet in diameter and 24 feet high — four Doric fiberglass jobs that cost $56,000 altogether, came in two pieces and required the assistance of an auto-body specialist, who sanded down the visible seams until they disappeared. For most people who drive through I’On, though, the columns do not stand out as individual objects. Instead, they dissolve into the backdrop of a more graceful past — something ephemeral that tugs at the heartstrings. Hill, who oversees I’On’s design scheme, belongs to a family that owns one of the oldest surviving plantation houses in South Carolina. He can enumerate the fine shadings of snobbery that the Charleston elite attached to columns (they were modest before the Civil War, when entrenched and interrelated families genteelly hid their wealth; it was after the war that the huge ones began to appear, the muscular commentary of new-rich industrialists). The aesthetic has proved successful with buyers like Gary O’Neil and his wife. Back in New Hampshire, they prepared to buy a home in Charleston by renting “Gone With the Wind” and the television mini-series “North and South.” Their home at I’On is surrounded on all sides by handsome Doric columns. Families like the O’Neils and the Melis continue to stream into the South from other parts of the country. They are taking advantage of all the attributes of the New South — cheap land, cheap labor and cheap money — but they are also looking for a lifestyle that lives in their imagination. On a recent morning, Helen Clem, an interior decorator who retired to I’On from Connecticut, sat on her porch recalling the powerful effect “Gone With the Wind” had on her when she watched it as a girl. Something about it — the way they held on to their elegance — made her think: That is what I would like to have. Her desire was not fulfilled until four years ago, when she stood on a pile of dirt at I’On and decided to take a chance. She now looks out through a row of six Doric columns to the ring of homes that stand around a man-made lake. Their porches create an unbroken colonnade that, from this distance, could have been there for a hundred years. She gives a small, sweet smile of satisfaction.